If you're lucky, you call her Vika. From her high-profile jobs as an in-demand timepiece and jewelry writer for the International New York Times to her Editor-in-Chief position at JCK magazine, she's an industry expert and pretty much always the most fun person in the room. (Plus, how many people do you know with a namesake Shinola watch?) She's traveled everywhere – from pearl farms in Australia to gemstone mines in Tanzania – but it's her former life as a Mexican fisherman that you need to know about. Earrings by Taffin for Sotheby's. The Gumuchain Tahitian pearl and diamond ring she won at a jewelry event. Spinel earrings (her favorite gemstone) by Eclat . Victoria and her boyfriend Jim enjoying Mexico. Scoping out Diego Rivera murals in Mexico City. Victoria swears she was a Mexican fisherman in her last life! The menu at Noodle Pudding, a cozy Italian restaurant in Brooklyn Heights, just outside of Manhattan. 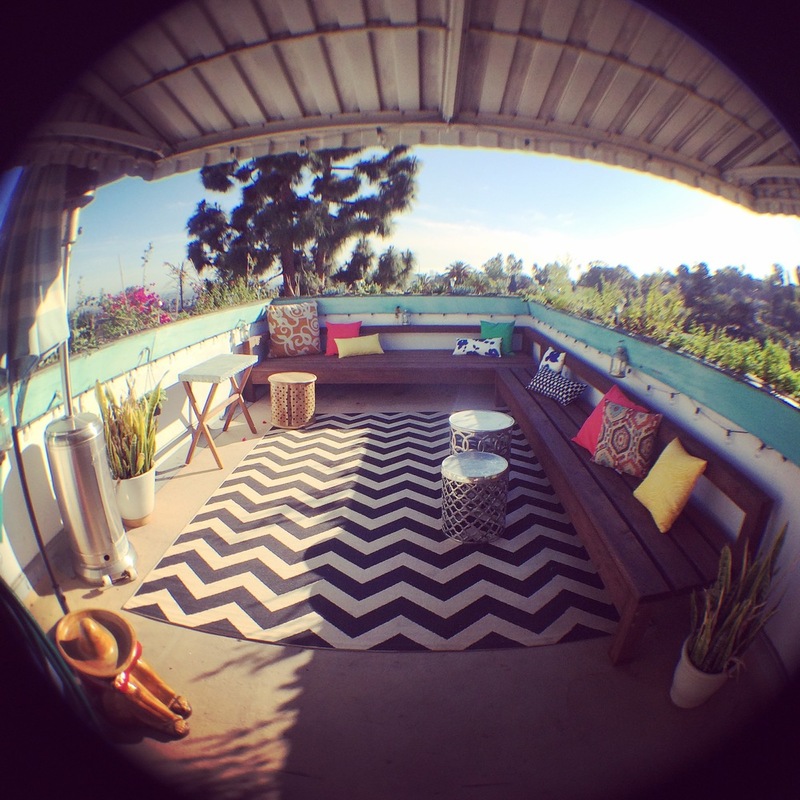 Vika's deck in Beachwood Canyon, Los Angeles. Her favorite spot to gather friends for BBQs and cocktails! When I’m in Brooklyn Heights, Noodle Pudding is my dining room. It’s a cozy family-owned Italian place named after the specialty of the town in Italy where the family is from (or so I’ve been told), it’s cash only, and the pork chop served with hot peppers and mashed potatoes is on my top 5 list of favorite meals. When I’m in Los Angeles, it’s a toss-up between the carne asada tacos at Lares, the best Mexican restaurant west of the 405, and the frickles (fried pickles!) at Birds, a cheap and cheerful neighborhood bar in Franklin Village. If you could buy any piece of contemporary jewelry, what would it be and why? I love everything by Taffin, especially his earrings and rings set with inverted diamonds—they remind me of little sea urchins. The vacation spot that you keep going back to over and over? Mexico! I was a Mexican in my last life and feel equally at home in the cities (Oaxaca and Mexico City), on the beaches (Puerto Escondido, Zihuatanejo, and a killer little resort just south of Rosarito in Baja called Las Rocas), and at the ruins (Tulum! Teotihuacan!). What’s the last book you couldn’t put down? Any bar that serves a tasty Manhattan is fine by me. It’s your birthday and your favorite flower arrangement arrives – what does it look like? I love plants, but I have a black thumb, so I gravitate to flowering succulents because they’re very resilient. I live in L.A.’s Beachwood Canyon, the road that leads straight to the Hollywood sign. Not only are there miles of trails that wind around the sign and into Griffith Park (all offering spectacular views of downtown L.A. and the Pacific Ocean), there are also numerous staircases leading from one canyon street to another; three sets up and down the stairway closest to the Beachwood Café in the heart of Hollywoodland kicks my a**. I love René Magritte, the Belgian surrealist. But I don’t speak French or Flemish—so my English-speaking backup would be the German photographer Thomas Struth (I’m fascinated by his work, plus he is married to someone with whom I went to grad school). Share a photo of the most sentimental piece of jewelry you own and tell us the back story. On the same day that the knock-off ring I bought in Dubai broke, I won another cocktail ring in a press drawing: a Gumuchian Tahitian pearl set in a substantial, flower-like 18k yellow gold setting. That was December 2004, and I’ve worn it nearly every day since. When I moved back to L.A. in December 2009 (after 11 years in NYC), I bought myself a 2006 BMW 325i because I wanted something nondescript that would run well for a long time. So far, so good! You’re having guests for the weekend. What’s your signature dish that you cook for them? I’m a terrible cook—so terrible that I can only prepare things (as opposed to cook them). My go to meal is raclette, a delicious-beyond-words Swiss cheese that’s served melted with boiled potatoes, cornichons, pickled vegetables, prosciutto, and copious amounts of white wine.